Those whose cars break down in Sublett or in the Sublett Range feel as if they are stranded in the middle of nowhere. The mountainous surroundings of Sublett also make it a car malfunction or accident even more dangerous, as the passes and slick conditions can further endanger the lives of your family and friends in the car. If you are stranded in the Sublett range, make sure to contact our Sublett towing service, located only 45 minutes away. Not only are we the closest towing company to Sublett, we also have the most competitive prices and comprehensive service packages to help you get back on the road. Sublett and the Sublett Range may seem like a long way from civilization that can help you after vehicle trouble, but it is relatively close to our Snake River Towing office in Burley. We will immediately dispatch a driver after your call, and our service hours are always open, including late nights and early mornings. We have experience in handling all types and classes of vehicles, so whether your semi’s engine failed or a tire on your car blew out, we can handle all of it, providing you with the fastest, most reliable towing experience. Sublett is a located off a main highway with many other roads leading to and from the town. This often means that it is a stopping point for many truck drivers. With such as small town, we are equipped to handle any service call out to Sublett to respond to big wrecker incidents or big rig breakdowns. We have the best drivers and necessary equipment to handle large-scale semi damages, and our friendly staff will work with you and your company to your fullest satisfaction, including providing and filling out any necessary paperwork you may need for documentation. AAA members will be pleased to hear that our towing services are covered through your membership benefits. We have a long-standing relationship with AAA and represent their commitment of excellence as their premiere towing service in Sublett. To get faster service as an AAA member, you can call us directly and we will work out the billing with AAA afterwards. This guarantees you less time on the phone, a quicker dispatch, and the surety that your tow is covered by the respected AAA brand. Many people worry about leaving their vehicle in the hands of a driver they don’t know, but this will not be the case with Snake River Towing’s drivers. 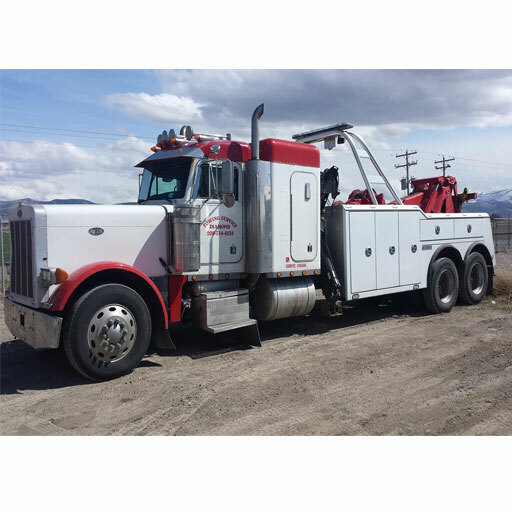 Each tow-er is Wreck Master certified, meaning they have received the highest quality training to handle different types of tow jobs, and each driver has years of experience doing hundreds of tows. What is more, you can always expect that the drivers who greets you in Sublett will be friendly, kind, and professional. We hold our services, drivers, and customer service employees to the highest standards in our industry. We work to your satisfaction and have the experience needed to work with intricate tows, such as those involving police reports or insurance companies. You will not find a more dedicated, prompt staff to help you while stranded in Sublett or the Sublett Range. If you end up needing a tow in Sublett or find yourself on the side of the road anywhere in Southern Idaho, call Snake River Towing at (208) 878-4357. You will be able to rely on us and our comprehensive towing services throughout the area so you get back tow the road and where you need to be.